All-Terrain Pro with Versa-Track™ – the toughest, most agile trailer made. These rugged utility trailers have all the same top-quality features and components as our larger tilt trailer models, but are sized to carry one snowmobile or ATV. With these dimensions, the All-Terrain Pro Utility Trailer can be used to haul your ATV into tight spots. Once there, you can unload your ATV and hook it up to your All-Terrain Pro Utility Trailer for use in the field. 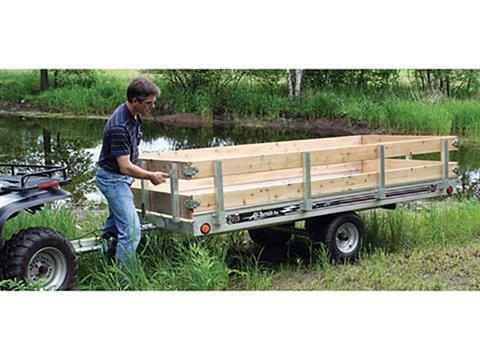 The All-Terrain Pro Utility Trailer is 54 inches wide and comes standard with three Versa-Tracks™ to secure a variety of loads. For those who want to corral their cargo, optional cedar / aluminum side kit is available and features a quick release gate system. The entire gate can be removed in minutes. Other options and accessories are available as well.